Here is an image of an L-connector. There are major issues with even the newer L-connectors. Note the poor reviews on Apple's website. I have a 13" MacBook Pro and have been having problems with the adapter, much like of what these issues have been with the earlier models that are being recalled. I have tryed to put in for the replacement adapter. unable to get through the deadline is at the end of this month what to do?? The recall has been extended to July 31, 2013. Try any Apple Store to have the connector replaced. It may be that both types have the issues but the design change away from the T shape to the in-line version is probably driven by excessive failure for which this recall is about. The recall has been extended to July 31, 2013. You seem to be correct about the T connectors. But Apple is also replacing L connectors generally. I will update the picture to reflect this. Note the poor reviews on the Apple site for the L Connector. 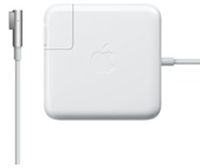 http://store.apple.com/us/product/MC461LL/A/apple-60w-magsafe-power-adapter-for-macbook-and-13-inch-macbook-pro . Thanks for visiting. I've had to replace this adapter at least 3 times, counting the $89 I just spent.. wouldn't let me log in Apple website, but iPhone store worked great. I searched and have NO clue about this new adapter, but hope this 85 Mag L connection solves the problem. If it doesn't, I'll scream. Just got back from Apple Genius Bar. Tech was a friend of the family, and couldn't take care of the issue. I remember when Apple took care of us. Darn! I threw mine away and have not used the laptop for at least a year. I hope I can get a replacement. Wish me luck. mag safe adapter cooked me alive particulary burned a hole 3inches long 1.5inch wide and deep right to the muscle!!!!!!!!!!!!!!! 2 operations was done under full anestetic and skin graft taken from my upper leg!!!!!!!!!!! Overheating of laptop power supplies can lead to abrupt laptop shutdown. One must always be careful about this fact, and use necessory precautions for ensuring better performance of laptop. Damn I wish I'd known about this recall. Terrible recall why they did not contact people about the problem.